Book Your Getaway on Points—Not Cash! When you think of a tropical vacation, what is the first image that comes to your mind? It may be of beautiful bungalows connected by a network of piers, standing over crystal blue water in some far off island nation. Luckily, your notions of having a luxurious getaway on an overwater bungalow may not be far off if you collect hotel points towards your next vacation. When it comes to staying at the world’s best overwater bungalows, many are accessible with the reward currencies you already collect from either staying at your favorite brands or through credit card spending. With a goal and some focused purchasing, you too can take a vacation in paradise—and call an overwater bungalow your home away from home. If you are looking for the perfect getaway in paradise, you’ve come to the right place. These are five of the best overwater bungalows you can stay at using hotel points. Famous for having their own private lagoon, the Conrad Bora Bora Nui is built jutting into the crystal blue waters of French Polynesia. The property boasts dozens of overwater bungalows built looking over the ocean, giving guests the sense of total freedom and privacy in paradise. Guests arrive on a boat from the Bora Bora Airport and are greeted by their choice of activities—from beach adventures and hilltop spa treatments to kids activities including club events and miniature golf. This exclusive slice of the world can be booked using Hilton Honors points, which are often more associated with their other brands in the United States and around the world. If you plan to book your trip to Bora Bora on points, you may want to start saving now: Awards for the best overwater bungalows can start at over 200,000 points per night during the peak season. Once you arrive and are greeted by the clear waters and granted a wake-up call from the ocean, you will find that it was well worth the price. Better known in Europe than the United States, Sofitel is a higher-end brand of AccorHotels that caters to the discerning traveler. Their brand in French Polynesia does not disappoint, featuring bookable overwater bungalows using Le Club AccorHotels points. The resort is built on the main island of the archipelago, a short walk away from pearl jewelry dealers, the local village, and alongside their own private island. Along with taking in the culture like a local, visitors can also indulge in the Eco Lagoon Tour, a swimming experience with local aquatic life, including rays and sharks. Unlike traditional hotel programs, Le Club AccorHotels points can be used to either book participating hotels directly, or trade their points in for credits towards future stays. 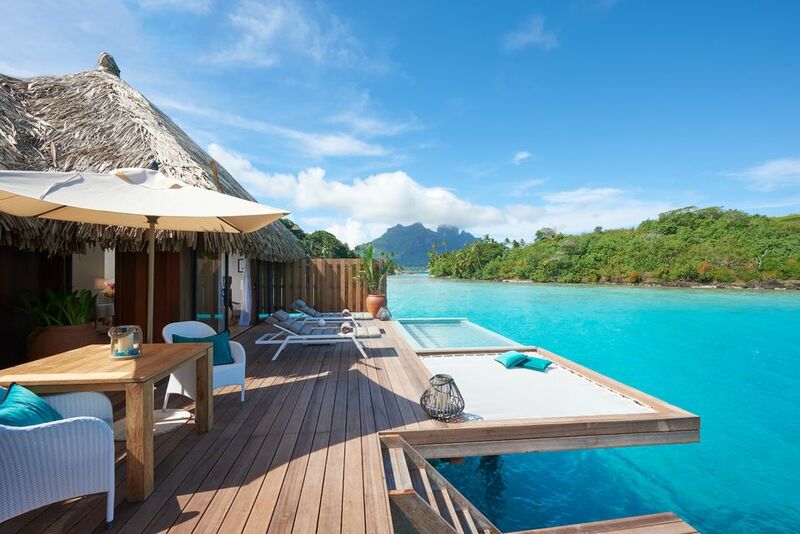 No matter how you elect to use your points, the Sofitel Bora Bora Marara Beach Resort represents a great way to use your points towards a great beachside vacation. Built on the Motu Piti A’au island that surrounds the east side of French Polynesia's main island of Bora Bora, the InterContinental Bora Bora Resort Thalasso Spa gives vacationers a new perspective of French Polynesia from another island. Popular with destination wedding parties for the glass-floor chapel, this resort encourages couples to rekindle their romance while scuba diving, taking a sunset cruise, or enjoying some quality time at their renowned spa. The InterContinental Bora Bora Resort Thalasso Spa is one of three resorts that can be booked with IHG Rewards Club points, earned through their credit card or by staying at their hotels around the world. To get the best deal here, book early: Reward space can go fast at this luxurious destination hotel. Not all of the best overwater bungalows are located on the island of Bora Bora. Just a short distance away on the island of Moorea, the InterContinental Moorea Resort and Spa maybe one of French Polynesia’s most overlooked resorts. While overwater bungalows can be booked using IHG Rewards Club points, those thinking about taking a trip to this island paradise should prepare to book well in advance. Especially during the summer months, award space can go quickly. However, IHG Rewards Club allows guests to book using all points, or a combination of points and cash for their rooms. Even if you don’t have enough points for a hotel room, getting a deep discount using points and cash can help you enjoy all the tropical amenities of this getaway destination. When many people think of the Holiday Inn brand, they often conjure thoughts of roadside stops, lounge singers, and taking road trips with their grandparents. Although it is not the most prestigious of InterContinental Hotel Group’s brands, there are still luxury deals to be found at their hotels—especially at the Holiday Inn Resort Vanuatu. Don’t let the name fool you: This isn’t your grandparents’ roadside hotel. Catering specifically to families traveling on vacation together, the Holiday Inn Resort Vanuatu offers something for every traveler on your itinerary. From family-sized pools and fun zones for kids of all ages to dedicated quiet zones for those who want to take in the peace of ocean life, this resort moves at your pace. Featured activities include paddle boarding, catamaran sailing, and snorkeling, along with guided market tours featuring the island’s local delicacies. Like the other two InterContinental hotels on this list, you can book your overwater bungalow here using IHG Rewards Club points. Who said staying at the Holiday Inn had to be a boring experience?